“We tend to have this sense about the medieval world, that it’s the Dark Ages and people were walking around in burlap sacks and there was plague and disease, and somehow it was always dark and rainy,” says Mann, who received his doctorate in history of art from the Krieger School. Instead, he points out, the medieval period was one of tremendous creativity, trade, and innovation. The Middle Ages witnessed the rise of the first universities and the building of magnificent cathedrals, where much of the era’s art was displayed and used as a primary means of communication with an audience that was illiterate. “These paintings and other objects are now collected as works of art,” explains Mann. “But when they were made, their primary function was something very different, something that was not solely aesthetic. 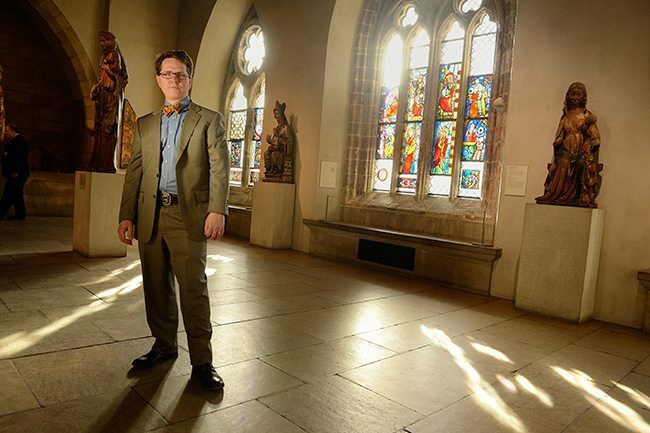 Medieval art was embedded in people’s lives in a way I’ve always found very exciting,” he says. At the Met, Mann divides his time between the main building, which displays medieval art within the broader context of an encyclopedic collection, and The Cloisters, which presents part of the museum’s collection from the western European Middle Ages in an environment that evokes an ecclesiastical or monastic setting. While the role of a curator at many institutions has changed and expanded in the 20 years since Mann began his career, the size of the Met’s collections (roughly 14,000 objects make up both locations’ total medieval holdings), in addition to its annual 6 million visitors, adds to the position’s challenges. In addition to maintaining, growing, and displaying a collection, says Mann, a curator must be a scholar, a fundraiser, and perhaps most importantly, a teacher. “My goal is to get people to find a way of connecting to something that at first might seem really esoteric or distant,” he explains. In addition to making those connections through curated exhibits like the recent Radiant Light: Stained Glass from Canterbury Cathedral at the Cloisters, Mann and other curators at the Met are turning to various technologies to help them tell the stories of their collections, such as the Met’s video series called 82nd & Fifth.